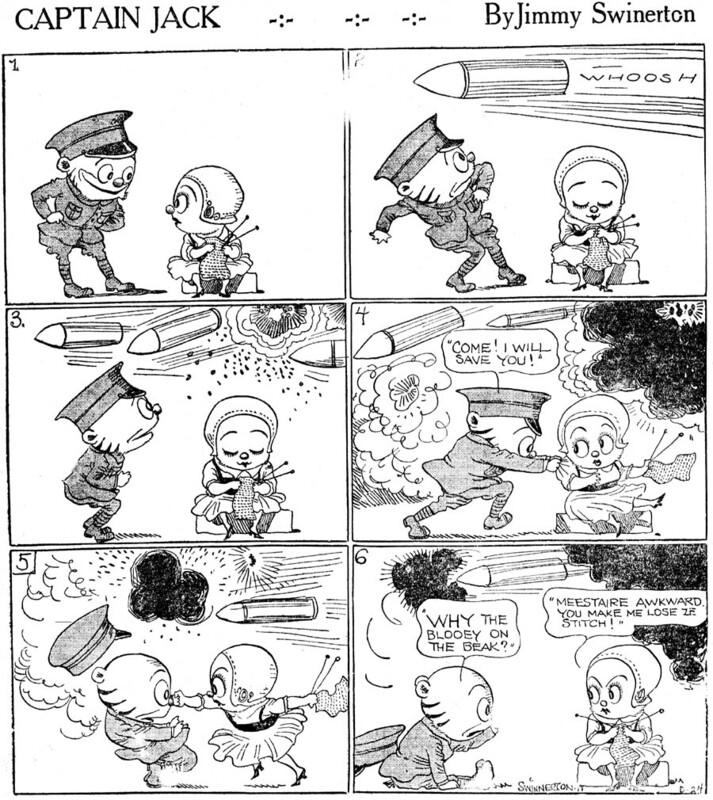 Here's a couple of 1917 Mister Jack strips by the great Jimmy Swinnerton. These are 'dailies' in that they ran in dailies papers rather than Sundays, but they were not produced six days per week. Many references cite the 1910s version of Mr. Jack as a daily, but t'ain't so. At this time Swinnerton was at the height of his powers. He evidently relished working on Mr. Jack more than the rather repetitive Little Jimmy, so it might come as a surprise that the Hearst organization seldom ran the Mr. Jack dailies in their New York papers. To find the black and white wartime Mr. Jack strips we must, for the most part, find them elsewhere. In fact, based on the Jeffrey Lindenblatt's indexing of the New York American, I had concluded that the Mr. Jack daily was produced only on a very sporadic basis. It wasn't until I got a look at the Pittsburgh Post that I found it to be produced, at least in the timeframe I got to see, on a very regular basis, several times per week. Before Ed Wheelan renamed his feature Minute Movies, before even it bothered with the name Midget Movies on a consistent basis, his long-running feature was just an untitled strip of 'movie film' that ran along the bottom edge of the New York American's comics page. 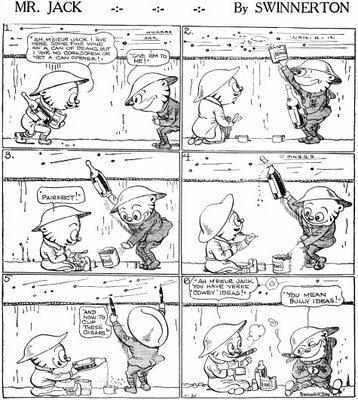 These are examples from the very first year of the strip, mostly November and December 1917. The feature began on January 31st of that year. The samples shown here are in pretty sad shape, even after a bit of a cleaning in Photoshop. Running along the bottom of the page as they did, clippings of these strips are usually brown and brittle. Bound volumes do a good job of protecting most of the newspaper within, but the material along the edge, exposed to the air, does not age very gracefully. 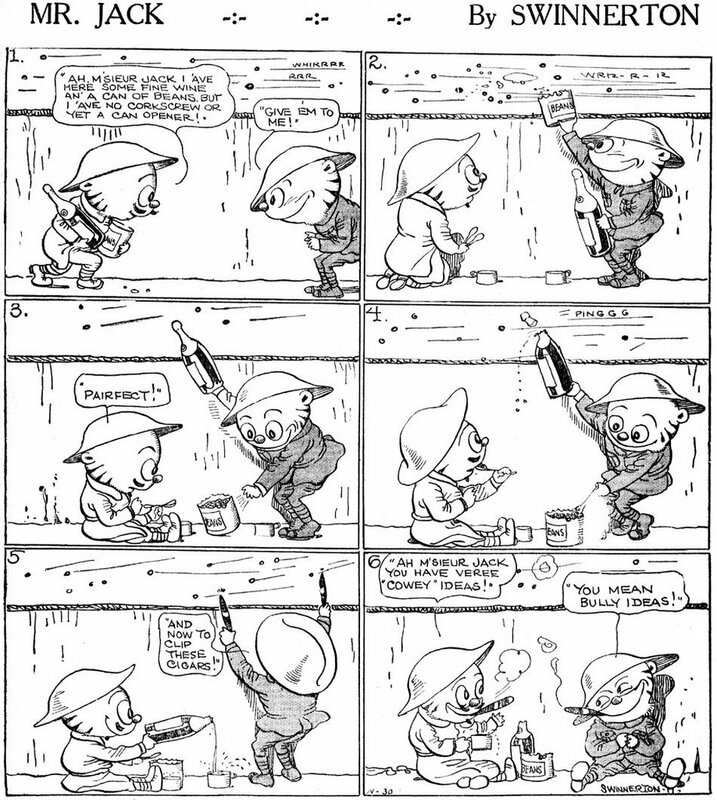 The same problem applies to much of the early Krazy Kat material, which was similar in that it ran in a long strip (vertically in the Kat's kase) usually along a page edge. This unusual feature, a single panel oblong that was printed quite large (usually 7 columns wide), was originally titled Letters From Sue To Lou. It began on September 24, 1922 and ran until sometime in 1938; the title was shortened in 1923. The feature was a weekly, marketed for inclusion in the Sunday magazine or women's section. Each 'strip' was a series of vignettes surrounding a short letter between the two principles, a pair of flapper types named Sue and Lou (short for Louise). Sometimes, as in our example, the drawings had precious little to do with the subject of the letter, but merely functioned as an excuse for creator Clarence Gettier to draw lots of his highly stylized pretty girls. Gettier did this feature as sort of a Sunday bookend for his daily series titled Girligags. Both features sported the same art style, sort of lowbrow art deco meets highbrow fashion art. Though the feature had a very healthy run at 17 years, it never appeared in all that many papers. And seldom will you see tearsheets of the strip for sale today since clippers tend to miss the unusually placed feature when going through a stack of papers or a bound volume. 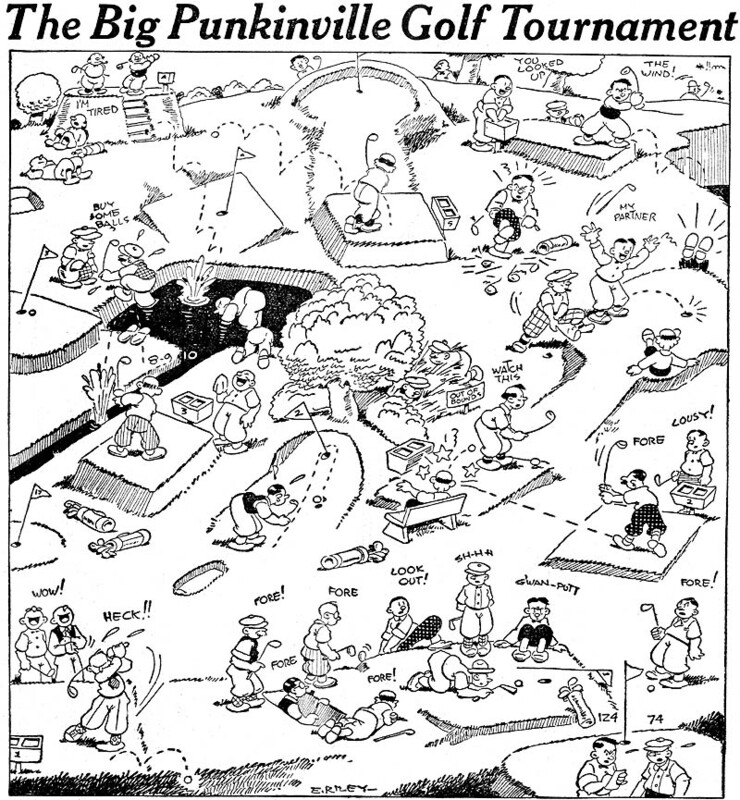 This obscure panel cartoon ran on the weekly Associated Editors kiddie page. Back in the 20s and 30s, many syndicates offered a weekly page to newspapers with a whole range of features intended for the youngsters. Most pages had a cartoon or comic strip, puzzles, games, activities, hobby projects, contests and so on. The concept survives today in slightly less ambitious scope with features like Shortcuts and the Mini-Page. The Associated Editors page featured a number of comic strips over the years, the most successful and long-running of which was The Adventures of Peter Pen. Today, though, we're looking at Punkinville, a feature that ran sporadically on the page, with often as much as eight weeks elapsing between appearances. The feature always showed a bird's-eye view of some activity or get-together in the titular village, and was rewarding enough if you took the time to study all the little vignette gags. 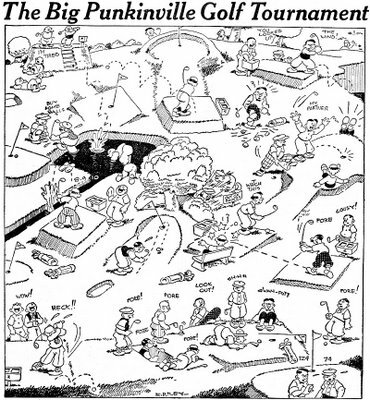 To me the feature always seemed a little out of place on the page - the subject matter (like the golf tournament shown here) seems more likely to interest adults than children. Perhaps that's why it appeared so infrequently; the editors knew it was a weak part of the page. Punkinville first appeared on October 30 1927, a date that makes you wonder if it was originally meant as a one-shot for Halloween. It lasted until May 3, 1931.